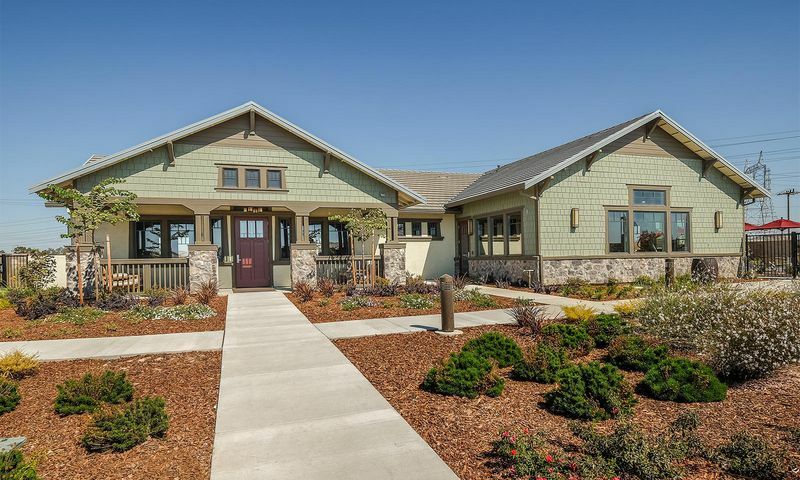 Heritage Vineyard Creek is a 55+ community located in Sacramento, California. This inviting community consists of 171 single-family homes that include open floor plans and main-level living. Homeowners enjoy living in a prime location with easy access to the airport, highways, and daily necessities. There will be an exclusive clubhouse for residents to enjoy. Residents will have fun meeting friends for parties and planned activities. Homeowners also make ample use of the indoor and outdoor amenities that cater to the active adult lifestyle. The clubhouse at Heritage Vineyard Creek is a place for all residents seeking fun and fitness. There is a fitness center inside as well as a multi-purpose room for throwing events or playing a round of cards. There is also be a catering kitchen, great for preparing snacks for parties. The amenities continue outside with a pool and patio located next to the clubhouse. Residents love playing a game of pickleball or tennis on the provided courts or challenging their neighbors to a round of bocce. Residents with green thumbs can use the community garden that is available and take pleasure in strolling throughout the community's vineyard area. Lennar Homes began construction on Heritage Vineyard Creek in 2017. This community plans to build 171 single-family homes in four different spacious floor plans. These homes will range in size from 1,743 up to 2,206 square feet. They will include two or three bedrooms, two or three bathrooms, and attached two-car garages. These energy-efficient home designs include standard features like large, open kitchens, high ceilings, master-on-main suites, and zero threshold showers. At Heritage Vineyard Creek, residents will truly live a resort-inspired lifestyle. Without the worries of home maintenance chores like mowing the lawn or shoveling snow, homeowners will have more time for fun hobbies and activities. Residents will meet at the clubhouse and make new friends while enjoying the many activities and clubs in the community. You can enjoy an active physical and social lifestyle as often as you want here. Heritage Vineyard Creek is located 15 minutes away from Route 99 and only minutes from downtown Sacramento, California. It offers the best of both worlds: a tranquil living environment with easy access to stores, restaurants, medical facilities, and nightlife. Popular attractions in the surrounding area include the California State Railroad Museum, Crocker Art Museum, American River Bicycle Trail, California State Capitol and Museum, Crest Theater, and Sacramento Zoo. When traveling is farther is needed, Sacramento International Airport is only 35 minutes away. Interstate 5 and Interstate 80 are also nearby, making travel to other parts of California a breeze. Heritage Vineyard Creek offers the ideal location for today's active adults to live in Sacramento, California. There are plenty of activities available in Heritage Vineyard Creek. Here is a sample of some of the clubs, activities and classes offered here. These homes will range in size from 1,743 square feet up to 2,206 square feet of living space. They will include two or three bedrooms, two or three bathrooms, and attached two-car garages. These energy efficient home designs include standard features like large, open kitchens, high ceilings, master-on-main suites, and zero threshold shower entry. 55places.com is not affiliated with the developer(s) or homeowners association of Heritage Vineyard Creek. The information you submit is distributed to a 55places.com Partner Agent, who is a licensed real estate agent. The information regarding Heritage Vineyard Creek has not been verified or approved by the developer or homeowners association. Please verify all information prior to purchasing. 55places.com is not responsible for any errors regarding the information displayed on this website.